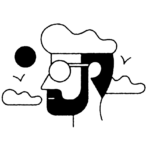 Wedding photos are often taken in a field of flowers, a forest, a place of significance to the couple —something romantic and beautiful that sets the tone of their happily ever after. 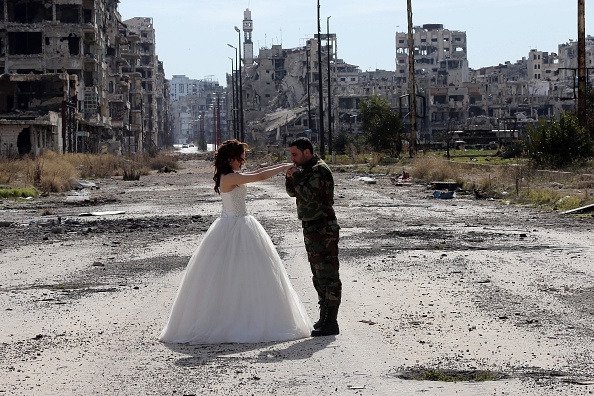 When Nada Merhi (18) and Hassan Youssef (27) were planning their wedding pictures, they decided to use a backdrop that is truly significant in that it proves that love conquers all: The ruins of Homs. 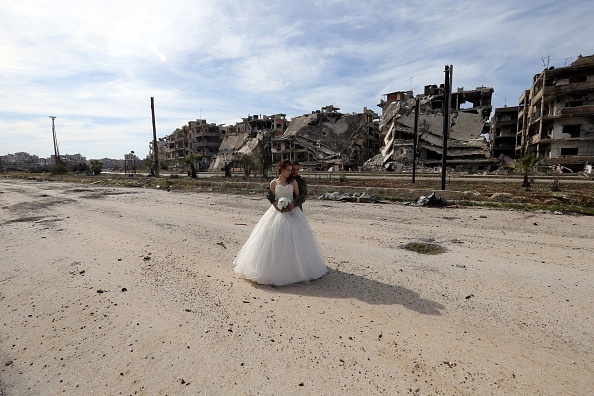 The city, which was once dubbed “capital of the revolution,” has been reduced to ruins and rubble; the war raged in this area for years. 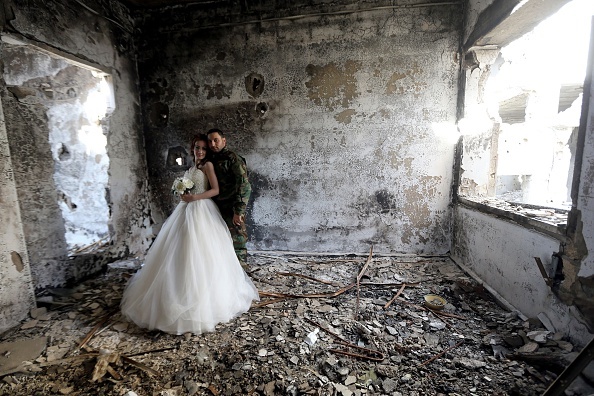 The couple posed in front of bullet holes and debris — she in a stunning white gown, he in a camouflage uniform, as he’s a soldier in Syrian President Bashar al-Assad’s army, which took the city from rebels in November. 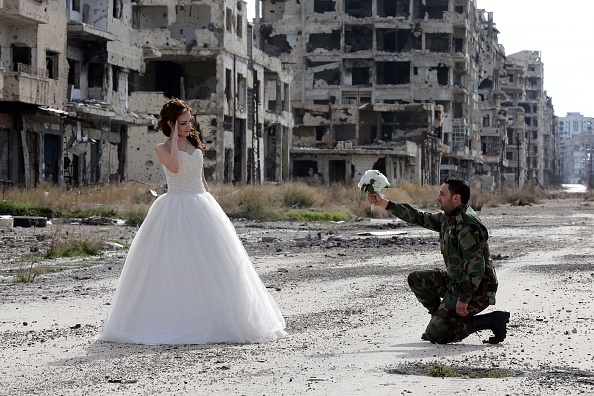 The conflict in Syria intensified in 2011 after Arab Spring protests inspired demonstrations that quickly snowballed into a civil war, resulting in a migrant crisis as refugees fled the country to escape the violence and bloodshed. 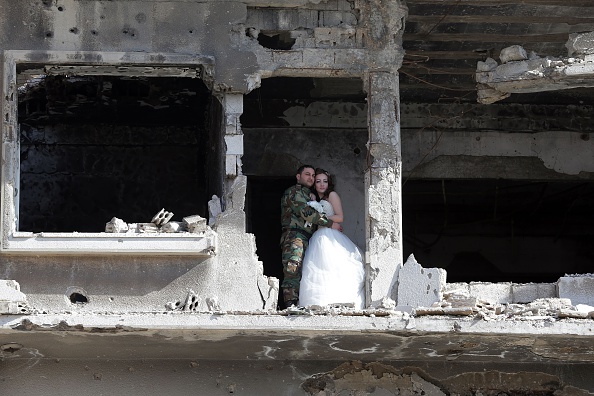 Although the war raged on, the love between Nada and Hassan kept on raging, too — and their wedding photos, taken on February 5th, seem to speak for the fact that they made it past all obstacles. Check out the stunning photos below, and a huge congratulations is in order for these two beautiful newlyweds.